Despite the fact that most of the Eastern seaboard is hunkering down for a massive storm (they’re predicting 11-17 inches for Philadelphia! ), spring is really just around the corner. And in anticipation of the coming canning season, I thought today would be the perfect time to feature all the new goodies the folks from Ball Canning are rolling out this year. First up are the new Spiral Jars. I’d seen a sneak peek of these a month or two ago on Facebook, but was uncertain whether I liked them or not (my initial thought was, why do we need our jars to spiral? What’s wrong with the classic shape?). However, having now seen them in person, I’ve changed my tune. These are really great jars. The twisting shape feels good in the hand and I like how simple the branding is. The sizing on these jars is a little different from what we’re used to. The smaller jar is a traditional 16 ounce pint, but the larger jar clocks in at just 28 ounces rather than a full quart. I can already tell that place where these jars are really going to shine is when it comes to to canning slightly taller things. I can’t wait to can up a batch of dilly beans or pickled carrot spears in these jars, knowing that there won’t be as much trimming involved. I took a picture of the spiral jars side by side with a regular pint and quart so that you can get a better idea of the new height. And if you do plan on canning in the taller spirals, make sure to measure your canning pot to ensure that you’ll be able to keep them fully submerged during the canning process. Next up are the new Sharing Jars. I’d not seen any previews of these jars before I opened up the box for this post and so they were a really fun surprise. These eight-sided jars are a charming addition to the Ball Canning line-up and they have a charitable component. Newell Brands (the new Ball Canning parent company) will donated four meals to Feeding America for every package of these jars purchased. 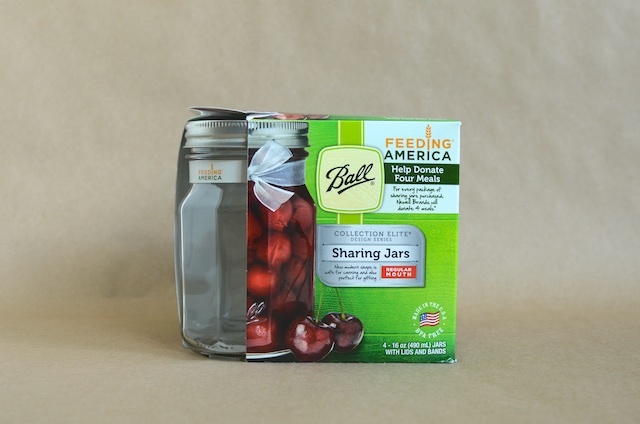 The sharing jars are only available in a regular mouth 16 ounce pint size and come with a little Feeding America ribbon tied around the neck of the jar. Last up are the new Sure Seal Bail Storage Jars. Designed to hold dry goods, these jars seal tightly with a lid that locks into place. They come in two sizes, 14 ounce and 38 ounce. I must confess that in comparison to the rest of the new jars, these feel a little clunky. Jars from Ball normally have a certain elegance that these two are just missing. Finally, the spices and accessories. The drink lids are one piece devises that screw onto jars without the aid of a ring (they’re more like those made by iLids and less like the ones from Cuppow) and allow you to use mason jars as travel mugs. A package comes with two lids and two straws and you can get them to fit either regular or wide mouth jars. The spices are particularly fun. 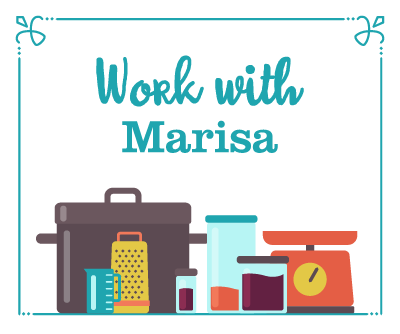 Made in partnership with McCormick, they are designed to make it easy for home canners to make and preserve things like tomato salsa, bread and butter pickles, fruit salsa, and pasta sauce. Now, for the giveaway! One lucky winner will get a set of everything featured in today’s blog post! Please use the widget below to enter. I can’t say I love the spiral jars. But the eight sided jars are a winner. I’m getting me some of those. I like the sure seal jars. I’ve been using some of my canning jars for dry storage and using either rings and lids or the plastic lids but haven’t been happy with either. These I like. I’ll have to get a few before I bake a batch of dog cookies. Poor thing is no longer allowed to eat commercial treats due to new diet. Sorry, but I don’t do Facebook, I don’t tweet and I don’t do twitter. Thank U 4 this giveaway opportunity. They always come up with such interesting stuff! I use Ball jars for everything. I like the spirals, but I also think I would like the Sure Seal jars. One would be nice to keep my homemade granola in on the table. As a researcher I am always excited to try new products and experiment. You can teach an old dog new tricks… tricks of the trade with all the new canning equipment. New jars! Always gets my attention. Planning for hand made goodies and gifts. Fabulous new products. Thanks for the chance to win. I really like the new spiral jars! Love them all. Thanks for the chance to win some GREAT products from a great company! 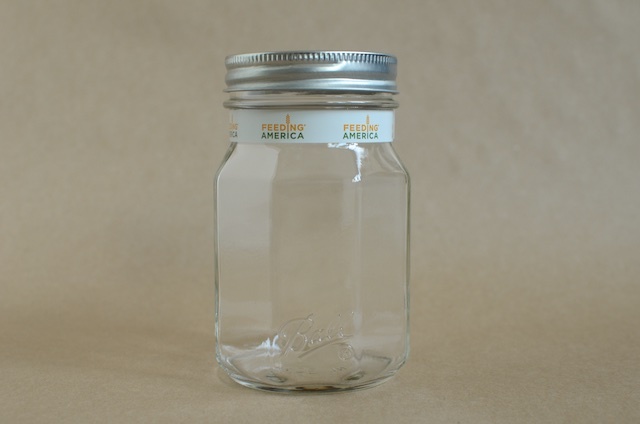 I hadn’t heard about those feeding America jars and I do like the shape of them. I’ll have to check them out. The spirals would be fun to pour syrups out of. LOVE the spiral jars! I hadn’t seen them before today. These are so much fun! 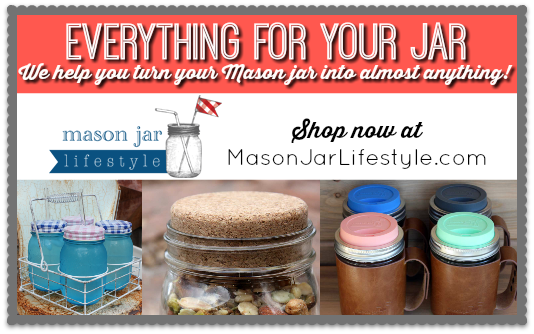 I’m addicted to mason jars – the drink lids especially are a great addition. I love bringing a serving of milk or kefir to work, but the two-part lids are a bit of a mess, and the plastic screw-on lids aren’t sufficiently water-tight. The spice packs are a great idea. Can’t wait to see them in stores. All of the new designs look interesting! Thank you for the chance to try them out! They all look great! I love the spiral jars! I am a sucker for a fancy jar! Those spiral jars are great. I want some! The spiral jars are beautiful. I hope I win them!! The spiral jars and the are really pretty! I didn’t need an excuse to buy more jars, my mother already says I have a problem. I think the spiral jars are fun! I LOVE that Ball has partnered with Feeding America, too! What a nice new line up. Looking forward to the Feeding America and Spiral jars. These will be great for gifts and raffle items. I really like what Ball is doing these days, especially the limited, “cleaner” branding on their jars. I’ve been preferring Kerr jars for that reason, but they are much harder to find in my area for some reason. The new Ball designs haven’t shown up in my usual jar purchasing haunts yet, but I’m hopeful! I LOVE, LOVE, LOVE Ball canning products. I tried to go with cheaper products, but found the quality just wasn’t up to par. These new products ALL seem fascinating. I look forward to seeing them on the store shelves ( and in my canning pantry). So many ideas come to mind to use these new jars. Thank you for this opportunity. The sharing jars look fantastic! I love jars. PERIOD! ? I’m excited to try the spiral jars along with the jars for storing dry goods! I love any of the new jars for gift giving during the holidays. I’m a big jelly/jam person and everyone loves them as gifts! I’m not a fan of the spiral jar, however I am in love with the sure seal jars! Thank you for the chance to win these great products! I’d love to use the new Spiral Jars! I really like the spiral jars! Love the spiral and sharing jars! I like the new jars and hadn’t heard about them . Thanks for the info and chance for a giveaway! I love the spiral jars! It’s always nice to have a taller jar with a smaller base. I love the new twisty jars! We are running low on jars in our house so it’s time for me to restock! I might just have to wait until the twisty jars are available. Those spiral jars are so cute! and I love how the sharing jars have room for a ribbon: I think I’ll be able to be more creative with my gift packaging this year! Hoping for those sharing jars especially! 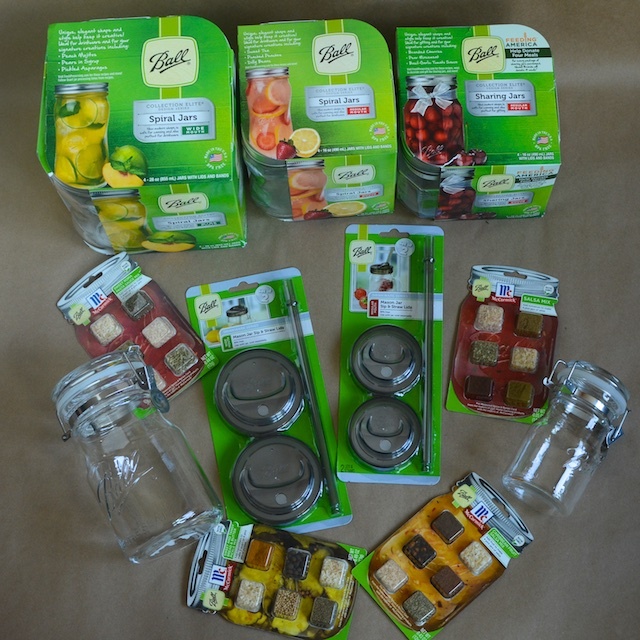 Excited to try Ball new products, I use my Ball jars every day! Love the sharing jars! I’ve already ordered some, but would love more! I love the look and giving concept behind the Sharing Jars. Very cool. The spiral jars are so pretty! I do love the sharing jars best! I can see alot of uses for the taller spiral jars. Thank u for sharing Ball’s newest products! The new jars are pretty! Love the new jars. Getting back to canning this summer. Oh! The spiral pints/lid combo seems to make for perfect travel glasses! I can’t wait to replace my miscellaneous spice jars with the new mini jars! Lovely jars! I’m looking forward to the spiral jars especially. would love this package! I love gifting my homemade products! So much more personal! Due to a surgery I missed canning last year. Looking forward to making tasty treats again this summer. Love the spiral and sharing jars!! Cannot wait to stock up! Oohh i like those! Looks lije there is more smooth surface area for putting fancy labels too! I think those spiral jars look awesome! I think I am most excited about the spiral jar. I also like the food share jars. I like the new ‘Spiral Jars’, that’s lovely. Does that mean that they wn’t be making a new ‘Vintage’ color this year? I have been hoping for an amber year! Wouldn’t the salt preserved lemons be beautiful in the spiral jars?! It amazes me how Ball comes up with new idea’s for canning jars and canning toys. I love the new season packets. It allows me to try new spices with out buying alot of spices that I may not use. Thank you for the wonderful contest. Those sharing jars look super nice! 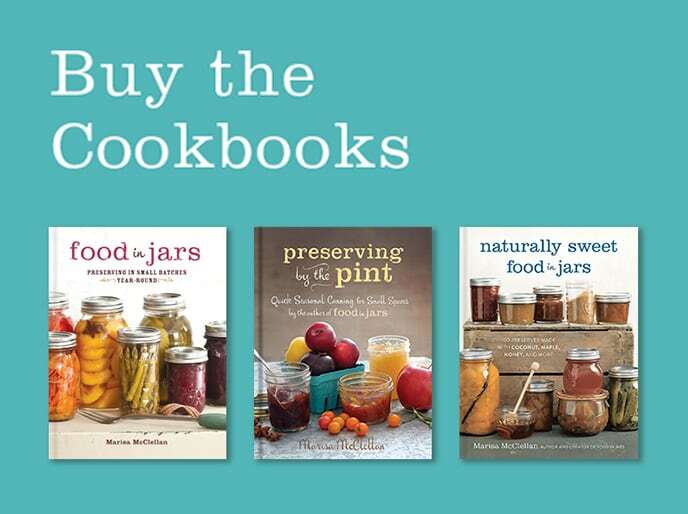 My only concern is with the height difference with the spiral jars – wondering if they will still fit in my shelves. …but I love the design and would think it would give a better grip for opening them. love the Sure Seal Bail Storage Jars! I love the Giving Jars, and the Spiral are very eye-catching! Thanks for the giveaway. Really like the sharing jars and happy to see Ball adding new items. I really like the spiral jars. I always worry about getting my smaller hands securely around a quart size jar. Can’t wait to try the spiral jars! Love the height of the spiral jars! Oh, those spice packs look useful! I love the sharing jars but I think they’re too nice to actually share! All of them? But probably especially the drink lids & spice mixes. I absolutely love the new spiral jars. I can think of so many goodies to make in these. Thank you for the chances to win these. The sharing jars and the one piece drinking lids! Tres exciting! I love the new spirals and sharing jars! Can’t wait to try them this season. Thanks, this is just the thing for a snow day! I like the look of the new spiral jars, which I haven’t yet seen in person. The day of a snowstorm in New England is the perfect day to think about summer and canning! I really like the look of the spiral jars, but I feel like I need to see the sharing jars in person to get a better sense of what they are all about. I like the sharing jars best. I just picked up new ball wide mouth bands amd lids today, looking forward to pickling! I think the new spiral jars are gorgeous and can’t wait to try the spice blends. I also think the lids and straws will be great for summer, maybe I’ll see if I can find some handled ball or mason jars for those. I just love that such an established company keeps putting new stuff out! I have really missed canning. Can’t wait for summer’s bounty so I can start again. Thanks for the great giveaway. The spirals and sharing jars look like fun. May be interesting to see how the larger spiral might affect “yield” produced. What do you think – will it be tricky to “get the last drop” out of the new jar designs? I think I’d like the sharing jars for pickle spears because they might fit into the corners better. The spiral jars have an interesting shape ! Wow, both the spiral jars and the sharing jars are gorgeous. I love that there is less branding too – leaves more room for creative labeling. I am upping my canning game this year and could use the jars you mentioned above, plus the canning gear. Canning is my stress reliever and gives me a great sense of accomplishment. Those spiral jars are to die for! Love them! I love the look of the new spiral jars and the functionality of the one piece lids! I am excited about the size of the large spiral jar. My seeds came in the mail this week and now this preview of new canning jars…. Spring is definitely just around the corner! Wow! All these new products. Makes me want to can some produce. I think the twisted jars are a little silly. What’s the point? I’ll stick with the traditional kind. Those spiral jars are really cute. Thanks for the chance! Spiral jars are definitely eye catching. The eight-sided jars are nice. And I think the spirals are sleek and pretty. Very excited for the new growing season to begin. Just stocked up on new jars and prepped used ines ? Love the look of the spiral jars! Thanks for the chance to win. It will make grasping the jars easier if you have any arthritis…. I love the spiral jars and the canning spices. I use canning jars for a lot of other things besides just canning. I love the spiral shaped ones. They are so pretty. I know I will have to buy some this year. OMG! I am so excited at all things new! the spiral jars are awesome! I can’t wait to try them. Just look at the spices! will definitely have to check these out! I hadn’t seen the sharing jars, how lovely! Those spiral jars look very cool! I also like the lid and straw combo. I love the sharing jars! The spiral jars look interesting but I also love the shape of the sharing jars. This all makes me want to head into my kitchen to start preserving stuff right now! Sadly, I’m stuck writing report cards right now…but soon! The sharing jars look very cool. Interesting jars- I don’t know how much I would use the spiral jars but they are attractive. 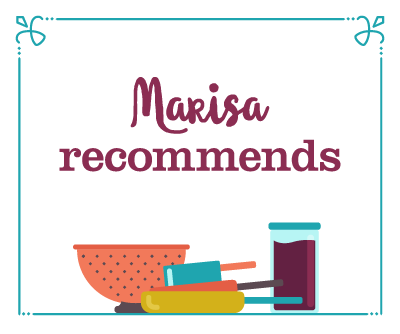 Marisa is right, the spiral jars really do feel great–easy to hold even when wet. Canning my own food is the only way I get to eat. Store canned food has too many preservatives for my body to handle.So when I saw you were doing a contest for canning gear I got so excited! This is wonderful! Good luck to everyone that enters! I really like the height on the spiral pints! Excited for the new product line! I love those spiral jars! A new way to decorate the jams and canned items I make for the holidays, then use the new drink lids and those gift jars are reusable. Thank you! I am really excited about the new products. I can’t wait to try them. I can’t wait for these to be in stores! Since I have arthritis i n my hands, the spiral jars might be easier to hold onto. I think some jellies would look even lovelier in the spirals! Love the spice packs. Don’t have to buy a jar of every spice, only to use it once a year. I love the new spiral jars and sharing jars. Loving the new spiral jars!! I like the look of the spiral jars but the cost is too much. Coming in packs of 4 jars and more expensive than 12 jars is not a good deal for me. I can to save money on groceries and so that we know what we are eating. I’m in love with the Sharing Jars! I really love the spiral jars, but would probably use them for storage (especially in my craft room) rather than for canning. I also love the idea behind the sharing jars! I like the sharing jars I liked to make jams and jellies and give them away to people. I’d love to try the spiral jars!!!! So many new fun things. I love the look of the new jars. Jars are my favorite thing and I store food in the pantry in them too. The spice packaging is a neat idea I want to try that out asap. Love the new jars, love the kit! I like every single item in this give away! The new spiral jars look great! I love Ball jars in any shape and size! I really like the sharing jars and the spiral jars! Love your emails to me. I’m an avid gardener and canner. Would like to know where to get the spice mixtures shown on this post. I’ve looked all over the place. It looks like you can multi-packs from Do It Best. I imagine that as we get closer to canning season, you’ll also start to see these in stores. I have only used the traditional canning jars, none of the fancier shapes or colors. I would love to put my holiday gifts in those cool spiral jars this year! I love to see them developing new jars and other products – it gives us more choices. I’m really curious about the spiral jars. I think you’re right, dilly beans seem like the perfect fit, and I’ll probably also use these jars for pickled carrots. Perhaps bourbon cherries will be extra festive in this shape. Fingers crossed the fruit crop is better this year than it was in ’16. I like the spices. The lids look pretty cool too. Excited about the new jars! I guess home canners have to have their containers down-sized too (28 oz instead of 32). The spirals are pretty. Excited about the spice mixes! Love the new storage jars with the flip tops! Love the new spiral jars, but I dont like the name of the sharing jars….. I would keep them all myself and NEVER share them because they are too cute! and I’m picky about which jars I can things in because if its something I might give away to someone, I dont use a ‘good/pretty’ jar, I just use the plain old regular jar. The spiral jars are making my imagination start thinking of taller veggies and fruits that I will be able to pickle and make attractive gifts, too. So many fun new shapes and sizes. I’m wondering if the spiral jars would make for interesting drinking glasses. I love the look of the sharing jars! I am so curious about the spice packs. I love the spiral jars. The new lids are super exciting! What a great giveaway! I can’t wait to find the new sharing jars and spiral jars! Excited about all the new products! I love the new Spiral jars, the spice packs and the sharing jars. I wish there was a Ball shop in Australia. Woolworths do have some jars, but not a very large choice. I love the spiral jars! I was skeptical too until I saw them in the store last weekend. Now I need some for my collection! Wow, I love the new designs! So fresh and clean and up to date! Thank you for the give a way! I reeaaallly hope they can make those sharing jars different sizes in the future! I will definitely be searching them out! Nice. Great looking line up of new products. So into the new jar shapes! I’m excited to try the spice packs! 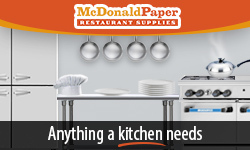 I’ve used McCormick spice packs for meals and they are great! I hate trimming beans! 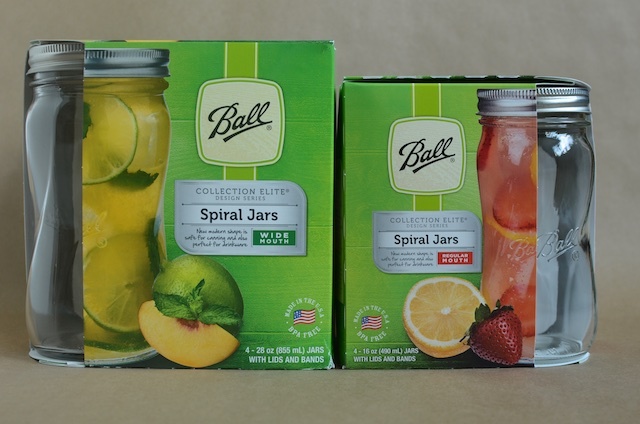 I am looking forward to trying the spiral jars – and thanks for the heads up in the quart size! Why are the sharing jars called sharing jars? Because of the charitable connection? 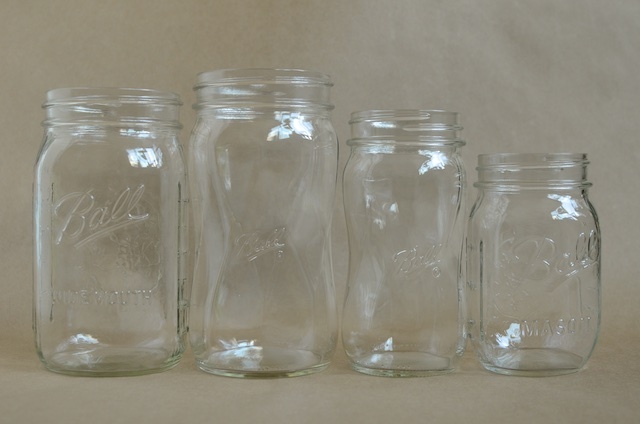 I have a collection of old canning jars (think 1970’s) would love to have some new ones! Love all the new products, especially the jars. Thanks for the giveaway. I randomly saw these in a Michael’s last week but didn’t have time to investigate. Very nice! Love the look of the jars! I can’t wait to use them for everything! I’m kind of enamored with the spiral jars! They just look so cool! Great new looks. ❤️ the spiral jars. It’s great to see Ball continue to innovate their line. Love all the new products. Can’t wait to try them! I really like the new spiral jars, a great way to showcase my fruits and vegetables! I like the taller spiral jars – they look like they’d be easier for “older” (and my that I mean me) hands to securely grip. I like the tall spiral but the 8 sided jars are just fabulous! Hey – that Katie there feels the same as this Katie here! Ha! Maybe I should sign it as Katie W then. I love the new Sharing Jars. What a great program. Thanks for the giveaway and sharing the new products. The new stuff is beautifully and thoughtfully done. Love it!! Luv the sharing jars…great idea! I’m one who likes uniformity, so I’m unlikely to buy any of the jars. I’m also disappointed the sizes (ounces) aren’t consistent with the traditional sizes. The tall “quart” would also not fit in my old canner. Those all look pretty fun. I like the spiral jars, I want to do pickled asparagus this spring, and those look like they’d be a good jar for that. Sigh! Ball just keeps coming out with cool stuff. Not that I really need more stuff but I love what is included in this offer. I already have a set of the tall spiral. I bought Balls lids and straws back when they first came out but like the idea of having one piece lids. I love the feeding America Jars. I plan of doing some canning this weekend. Thanks for sharing these options. The Sharing jars are such a great idea! Looking forward to checking the whole line out in my neighborhood store soon. I like that they keep creating new jars and do things like the purple/blue/green color lines but I probably won’t buy a ton of the new ones. Maybe the tall spiral since they are taller than the regular pints. I think it’s good for the jar lovers out there but I love the classics and have so many already. Glad to see the Feeding America partnership too. 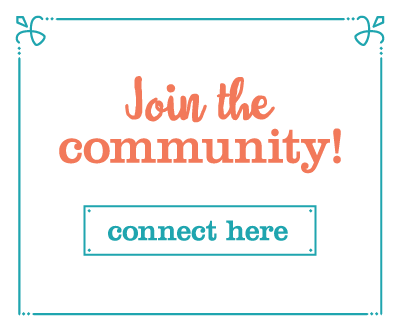 How great of Ball to share new products with YOU so you can share them with US! 😀 I really like the Spiral jars and the sure seal things… interesting new stuff! Those spiral jars would make lovely drinking glasses for the B&B. I wonder if the small ones are too big for juice? I really like that Ball keeps coming out with new and exciting items. 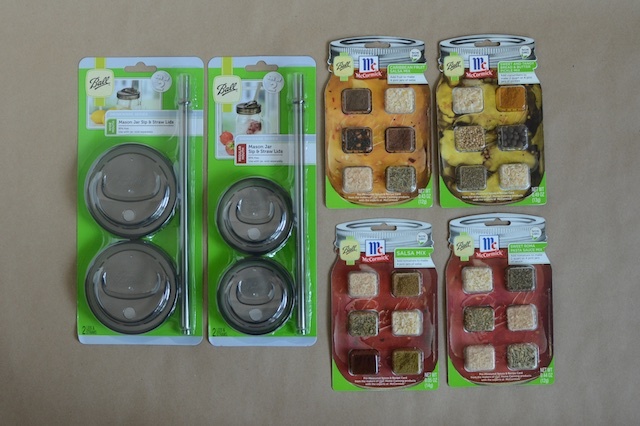 I love to can and store and the bail seal lids are perfect for my dehydrated foods! Love the 8 sided jars and that they are partnering with Feeding America. The spiral jars seem like they would be fun for something different at a baby or bridal shower. I’d also be interested in using them for pickling this summer! So excited for these new jars! I like the new Sip & Straw lids and the spices! Beautiful new stuff- cannot wait to try it out! Very interesting, but it seems like we really don’t need these new jars – I think all of the old one meet most of our needs and their simplicity is part of the charm . . . I really like the spice combos! They make it easier for beginners like me. I think the spiral jars will be great for iced coffee! I’d like to try the travel lids/straws…we already drink out of mason jars and I’ve been wanting to try a travel option for some time! These are all interesting. 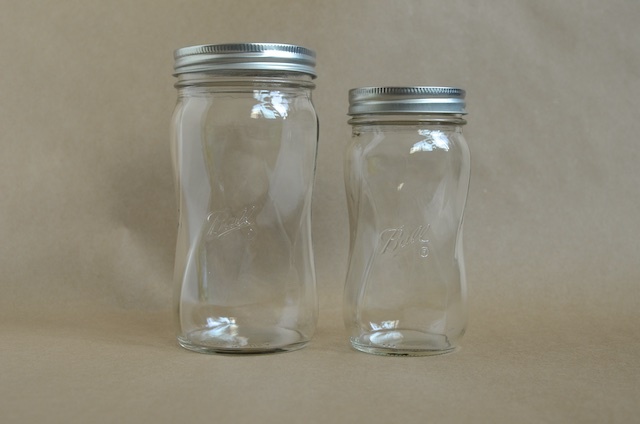 I agree about the flip jars, they do look a bit clunky, but the spiral jars are very elegant looking. Thank you so much for all you do! I am learning so much and having such a lot of fun 🙂 I cannot WAIT to hold the spiral jars! I ordered both the sharing jars and the spiral jars. Love both new styles plus the new minis. I am so impressed with the quality of Ball jars. It’s fun to see the fresh new items! I love the new spiral jars; great design! Those spiral ones are gorgeous. I’d love to see them in person. Bot the spiral and the sharing jars have pleasing shapes. Thanks for this opportunity. Love the sharing jar idea! I am new to the spice packs as well. I’m so happy to finally see a one piece drinking lid. I’ve wanting that for a while. Next step would be to make one with a really sturdily sealed spout type lid that is leakprook. I knock things over a lot and I don’t care for drinking with straws. I often just use the lid without straws, but it will leak when spilled. I love the sure seal storage jars! I LOVE all of the new things so much that I might cry if I don’t win them lol. I really love the sharing jars. And the charity that they will contribute to! I like the 8-sided jars. I’m afraid the spiral jars would be more likely to break, although they look really cool. I love, love, love the spiral jars! You are right, tall pickles would be great in these – asparagus, carrot, cucumber AND dilly beans! Wow, I hadn’t seen the spice packs. What a big help! I’d love to try those. I think the spiral jars are beautiful and would be great for gift giving. In need those lids and straws!!! The spiral jars are neat- maybe not for regular canning but for gifts etc. What fun new products. I agree that the spiral jars would make pretty gifts! I love the new spiral jars! So Cool. Love the fact that Ball is always coming out with new ideas. I personally love the new sure seal jars…So handy can’t wait to get some. I like the 8 sided jars especially! I’m glad I’m not the only one who gets excited about pretty ball jars. I love storing my bulk items in the really big jars such as grains and beans. Those sharing jars are cool! I love those spiral jars. What a unique look. The spiral jars are lovely! I find all of the jars lovely. Good on Ball for being innovative! Nice giveaway Marisa. I plan to get back on track with this months canning challenge. I missed Feb due to being out of town 3 weeks of the month. My 2017 new years resolution was to complete your challenge and the King Arthur Flour bakealong challenge all year. Variety is the spice of life. Something for everyone. I like the spiral jars. I think they would be easier to hold on to with arthritic hands! Such nifty new products! Love the lids and 8-sided jars. I really like the spiral and sharing jars. I agree about the Sure Seal jars. They are very clunky; not appealing to the eye at all. My mother would only use Ball jars when I was growing up (I am 76 yrs) and I have always done the same. I love the spiral jars. They have a great look! I love the sharing jars, too. I think perhaps the spiral jars will be easier to open and hang on to. My kids love drinking from Mason jars. I love the twist jars! They are beautiful! I liked the tall shape of the spiral jars and the sharing jars may not be lanky, but they are lovely. Thanks for the great offer. I love the new spiral jars! I voted for them last fall when ball sent me a survey. i think the spiral jars are awesome and can’t wait to get some! Thanks for sharing these new products. I like the idea of the spice packs!!!! Excited to try the spiral jars, they sounded unnecessary but I imagine the hand feel is great! I like jars of all kinds, especially Ball jars! I’m excited to start canning for the first time this year. Thanks for all the inspiration. I also like the 8-sided jars, I’ll see if I can find those locally (if I don’t win, of course-ha ha). 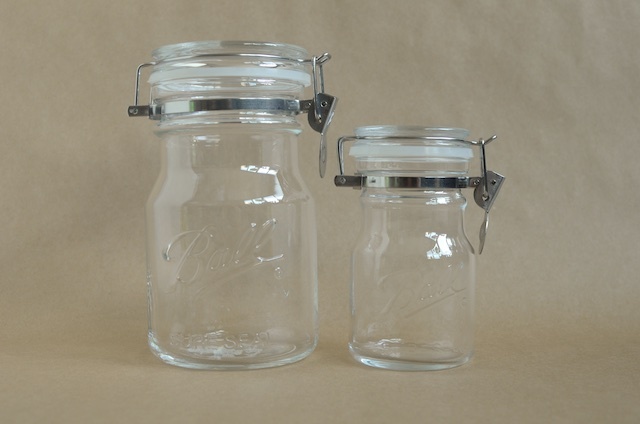 I just love canning jars and really welcome the new shapes and sizes. I enjoy gifting canned goods and the “fancy” shaped jars just seem to add that little something extra to the gifts. Love the sharing jars! What a great cause. I really like these new spiral jars, and the prepackaged spices! Spiral jars are pretty – and look like they might be a little easier to grip, for those of us with arthritis issues. spiral jars, I too sometimes want the jar to be a “tiny” bit taller. I’m loving the fancy jars…and the sure seal jars!! I like the sharing jars. I’m interested to see the dry goods jars too (I like integrated lids!) although I share your appreciation of the other jars’ simple elegance, Marisa. Excited about the new products! Love the new sharing jars! I love canning! Great giveaway!! Great giveaway, I like the spiral jars but they are all real cool! Thank you for the opportunity. The new spiral jars are adorable! I’m a little apprehensive about the spiral jars! I think the twisty jars are my favorite – so pretty! What a fun box to open! I am excited about the taller size of the spiral jars! I like the spiral jars but those covers also look handy. What a fantastic giveaway! Some super fun products coming out! Spiral jar = great water delivery for me! Great giveaway! I can’t wait to start canning this year. I love the sharing jars, since they have the look of a commercial jar, but without the hassle of having to can with a lug lid. 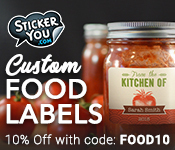 So many awesome products ~ I love the spiral and the sharing jars! So many fun things! I love the look of the spiral jars. I’m hoping the lids and straws are a good fit! These new kitchen items are so useful and clever. I am seriously infatuated with the Swirl Jars. So pretty! These look great, I’m looking forward to trying them out! Those spiral jars look pretty interesting! These are getting lots of creative thoughts going! Love both the new spiral jars and the sharing jars. Oh, and the spice kits are really great, I don’t have all those spices around. The sharing jars are amazing! I love that if you buy one they donate to feeding America. Although when I was looking at the jar section on their website the sharing jars didn’t have the sicker/ribbon around neck and they didn’t explain the concept of them either. Those spiral jars are so neat looking! Somehow I had the idea that they were not safe for canning, glad to hear that they are. What great prizes, would love to add to my canning equipment. Like the height of the spiral jars. What’s not to love? I love it all. Nothing like a Ball jar! I can’t wait to get my hands on the spiral jars! I love the shape of the sharing jars and the spirals. They’d really add some variety on my shelves of canned goods. The spiral and hexagonal jars are really cool! I could see using them not only for preserves but as storage jars in the pantry, too. The Sure Seal Bail Storage Jars look kind of top heavy, but I supposed that doesn’t really matter if they’re full of something that needs to be stored air tight, like granola or something. As for the lids and spices, well, they’re just plain fun! I think the sharing jars would make snack time and carrying lunches easier. Those spiral jars look pretty fun! Those spiral jars are cool looking! Love all of these new products. Sharing jars, such a nice thought. Sharing jars have a beautiful shape and thought. The spiral jars are beautiful! I can’t wait to use them! These jars are so pretty!